Links to further pages on the ski mountaineering possibilities in some of the worlds more far-flung and unusual snowy countries. 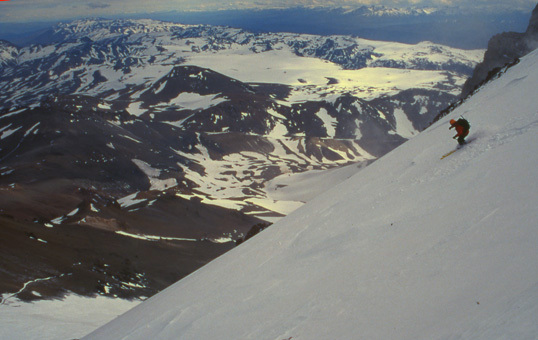 David Roberts skiing from the summit of Volcan Domuyo. At 4709m, it is the highest mountain in Patagonia. For information and pictures from ski tours in some areas of the European Alps see our Alpine Ski Mountaineering index page. For elsewhere in Europe see our European Ski Mountaineering index. 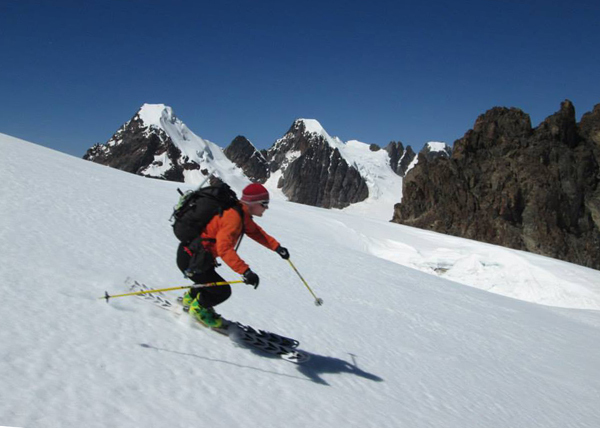 Argentina Some of the best ski-mountaineering in the Andes. Bolivia Bolivia has some good ski mountaineering possibilities, in the Cordillera Real and the western volcanoes. Brazil Believe it or not you can occasionally ski here too, and we're not talking water-skiing! United States Reports and photos from some of the forgotten corners of the USA. Armenia Volcanoes and easy alpine stuff in a really friendly country. China An ascent of Muztag Ata, at 7546m one of the world's highest truly skiable peaks. Georgia Some of the highest peaks in the Caucasus mountains. Kazakhstan The beautiful Tien Shan mountains in this Central Asian republic. David Roberts skiing at 5200m on Culin Thojo, Cordillera Real, Bolivia.